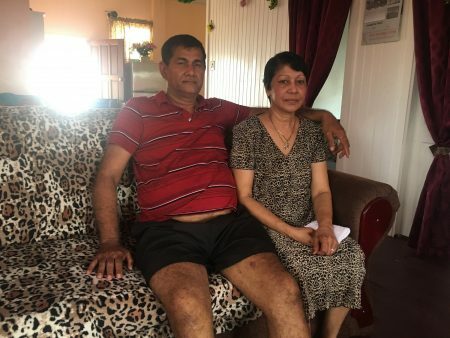 After being held up at gunpoint early Friday morning and robbed of more than US$10,000 in cash and jewellery, an overseas-based Guyanese couple say they fear returning to Guyana, especially during the holiday season. Sixty-two-year-old Manbodh Shivram, a supervisor of an oil refinery in Texas and his 60-year-old wife, Kamala Shivram, along with their driver were held up by three gun-toting bandits around 1:30 am and were robbed of cash and jewellery. “We were supposed to reach the airport [Cheddi Jagan International Airport] around 10:30 pm but the flight was delayed in Trinidad and we came in about midnight and by the time we cleared it was almost 12:30 am [Friday]. So, we were driving coming down and the potholes on the road, the vehicle hit one somewhere by Grove and you could tell it was a serious pothole because it buss the tyre,” Shivram related to Stabroek News yesterday. After they stopped the car, which was being driven by a family friend, one of the suitcases from the trunk was removed so that they could access the spare wheel. Upon removing the spare wheel they discovered that they did not have the necessary equipment to change the tyre. Manbodh Shivram and Kamala Shivram in their Eccles, East Bank Demerara home yesterday. “The road was pretty dark but the house we stopped at, when we went to change the tyre, lent us the jack handle and the wheel spanner and we changed it and were almost finished when a white [Toyota] Premio (PSS 3916) pulled up. We thought that they stopped to help us but we were wrong,” Shivram added. He said that when three men stormed out of the car he realized that they were about to be robbed. One person rushed to Shivram and commanded that he lay on the floor and surrender whatever money and jewellery he had on him. “One run up with a gun and tell me to get down on my knees and like I didn’t even panic and he run through me,” he said. Shivram explained that prior to him leaving the car to assist with changing the wheel, he had taken off all of his jewellery and had given it to his wife who was still inside of the car. After not finding anything on him or on the driver, the men pounced on his wife and demanded that she hand over her bags and whatever jewellery and money she had on her. 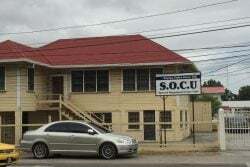 “One come at each side and said that he doesn’t want to shoot anyone and that I should hand over the bag but I said no because I had all my passport and other important documents inside and so he grabbed onto it and started pulling and I pulled back until he overpowered …me,” the woman told Stabroek News. After grabbing the woman’s bag that was in her hand and others that were in the car, the three men snatched the suitcase that was on the road and escaped. Along with losing two iPhones, one iPad, two watches, two cameras, a quantity of gold and diamond jewellery, a suitcase containing clothing and foodstuff and important documents including passports, drivers’ licences and bank cards, Shivram pointed out that they lost US$2,000 in cash, which brings their total loss to over US$10,000. While Shivram had spent Christmas and New Year’s in his home country last year and visits annually, his wife had not been back in the country in over 15 years. What was supposed to be a relaxing vacation for the couple, has turned very sour and now they are unsure as to whether they want to return to their home soil again. Shivram said that their main focus right now is ensuring that they can return to the United States of America on Thursday. “…I mean you read about these things in the news, you know. But you don’t expect it to happen to you. We are not coming back, at least not Christmas time. It’s about 20 years now we living overseas and like everyone else you want a nice `lil time and then go back but it was rough this time,” Shivram said, while adding that he is of the opinion that more work needs to be done by the Guyana Police Force during the Christmas Season, especially in the nights. He also added that the family is offering a reward of US$1,000 for anyone who has information pertaining to the robbery, which would allow them to be able to retrieve their important documents soon. The police are yet to arrest any suspects.